Unibridge recently attended the CivEnEx show in Sydney and the Queensland Transport and Urban Development Conference in Brisbane. Both venues provided local council members, engineers, delegates and conference attendees with the opportunity to learn more about Unibridge solutions. 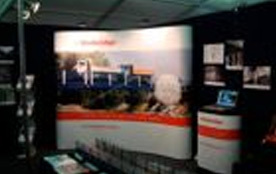 Queensland local councils embraced the Unibridge precast concrete bridge solution and several quotes were requested and delivered to council members during the show. Engineering firms at CivEnEx took notice of Unibridge's 21st century response to modern problems facing hundreds of Australian councils countrywide. For permanent or temporary situations, the Unibridge concept is particularly well adapted to the specific needs of remote communities, either for the replacement of aging bridges which no longer meet contemporary safety criteria or modern traffic loadings, or for the creation of new roads. The Unibridge system provides modern, durable and robust bridges, meeting the AS 1600 technical standards. Local government authorities or municipalities can install Unibridge systems quickly with minimal external assistance. Construction industry attendees were very interested in the speed and ease with which Unibridge all steel bridges can be assembled and operational - often within hours. Also, the unique potential of the Unibridge all steel solution to be moved to another location, easily expanded to meet needs or sold as required even after a long permanent application mean it is always an asset to the owner. Unibridge is the modern solution to current challenges faced by local councils, construction and engineering firms and is already the market leader in clear span bridges meeting rugged Australian Standards for the future.